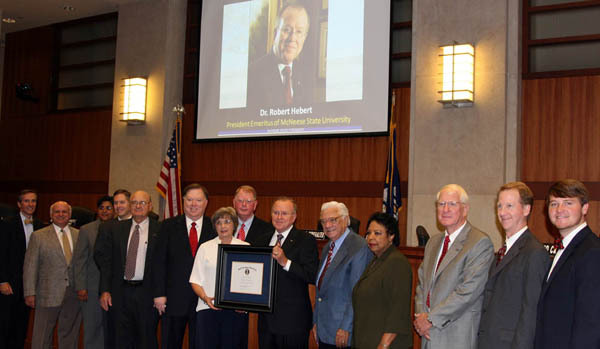 BATON ROUGE – The Board of Supervisors for the University of Louisiana System today named Robert Hebert President Emeritus of McNeese State University. Hebert retired in June after serving 41 years at McNeese and 23 of them as president, making him the university’s longest-serving president. “I am extremely grateful. This is a great honor, and I would like to honor my wife, Lilly Ann, too. She deserves recognition for her many years of supporting me. Further, I cannot accept this award without mentioning not only the current staff, but also the many former staff members who worked so hard at McNeese,” said Hebert. “Dr. Hebert transformed McNeese State University from introducing its motto, ‘Excellence with a Personal Touch,’ to enhancing facilities, academics, research, athletics, and community partnerships. He is very deserving of this honor,” said University of Louisiana System President who made the recommendation to the Board. According to Board Rules, only the System President can recommend to the Board the awarding of President Emeritus. The title is to honor, in retirement, individuals who have made distinguished professional contributions and have served significant portions of their careers at the institution. Specifically, to be considered an individual must have a minimum of ten consecutive years of full-time employment with the university immediately prior to retirement at the institution; clear evidence of outstanding teaching, scholarly activity, and/or administrative services; recognized record of meritorious professional achievement, growth, and development; and clear evidence of university service beyond the normal or ordinary expectations. Board Member Carl Shetler of Lake Charles introduced the motion. “Bob has always done his job and done it well. 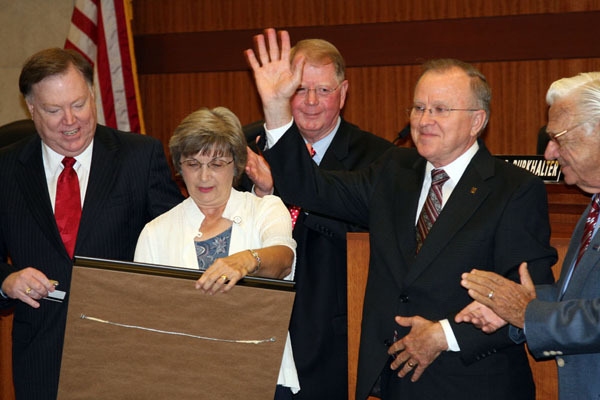 We have had a great relationship over the years I have served on this Board, and it has been a pleasure working with him,” said Shetler. During his tenure as president, Hebert initiated selective admissions in 2000 that led to higher average ACT scores for incoming students, improved student retention rates and 14 consecutive enrollment increases including an all-time record of 8,992 in fall 2005. He supervised numerous campus construction and renovation projects for a total expenditure of $105.8 million from 1987 to 2010. This included the Shearman Fine Arts Center, new apartment-style housing, parking upgrades and new campus signage. Hebert worked to increase private fundraising, raising the assets of the McNeese Foundation from $1 million to over $55 million. In the process, the university gained 84 endowed professorships and chairs. Fostering community partnerships is a hallmark of Hebert’s career. He was instrumental in the creation and development of the Banners Cultural Series 18 years ago and instrumental in the establishment of the Southwest Louisiana Entrepreneurial and Economic Development Center at McNeese. A defining moment of Hebert’s leadership came in 2005, when Hurricane Rita struck the university leaving $30 million in damages to nearly every building on campus. Hebert and his team worked to bring classes back only five weeks later and successfully graduated students that same semester. Hebert joined the McNeese faculty as an associate professor of history. Prior to coming to McNeese, he taught for seven years at Mississippi State University. He served as vice president of academic affairs from 1980 to 1987. Prior to that, he was the Director of Basic Studies, chairman of the University Curriculum Committee, president of the Faculty Senate and a professor in the Department of History. His field of specialization is modern European history and international relations. He holds doctorate and master’s degrees from Florida State University. His bachelor’s degree is from the University of Southwestern Louisiana, now known as the University of Louisiana at Lafayette. He is a native of Abbeville and is married to the former Lilly Ann Vincent of Henry. They have four sons-Greg, Chris, Gerry and Edward, all completed undergraduate degrees at McNeese and all are medical school graduates. Email Jackie at jtisdell@uls.state.la.us for high resolution versions of the photos. 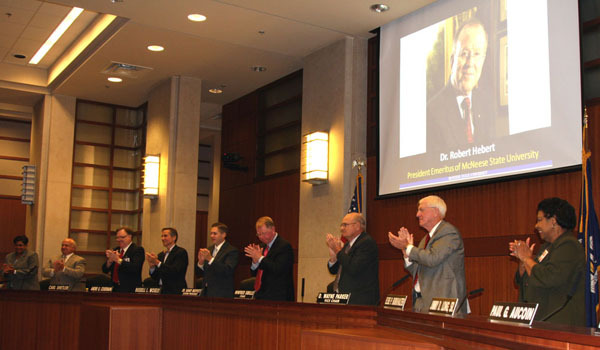 UL System Board Members give McNeese President-Emeritus Robert Hebert a standing ovation. Pictured from left are Renee Lapeyrolerie, E. Gerald Hebert, Carl Shelter, Andre Coudrain, Russell Mosely, Randy Moffett, Winfred Sibille, D. Wayne Parker and Elsie Burkhalter. Pictured from left to right: UL System Board Members Andre Coudrain, E. Gerald Hebert, Renee Lapeyrolerie, Russell Mosely, Chair Winfred Sibille, Carl Shetler, Lilly Anne Hebert, UL System President Randy Moffett, McNeese President-Emeritus Robert Hebert and UL System Board Members Jimmy Long, Sr., Elsie Burkhalter, Vice Chair D. Wayne Parker, Edward Crawford, III, and Brooke Sebren. McNeese State University President-Emeritus (second from right) waives to the audience as his wife, Lilly Anne, admires the award. Pictured from left are UL System Board Member Carl Shetler, Lilly Ann Hebert, UL System President Randy Moffett, Hebert and UL System Board Member Jimmy Long, Sr.